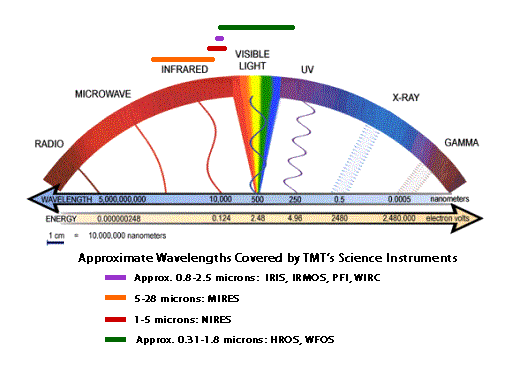 The sun emits light over a wide range of the electromagnetic spectrum. The visible range demonstrates the greatest intensity, and can be seen through the human eye. However the sun radiates what is known as a ‘continuum’ which extends much farther that to that which we can see; this band of electromagnetic radiation stretches from the ultraviolet up the infrared. The spectrum of the sun peaks in the visible section of the electromagnetic spectrum, due to the high temperature of the sun in the photosphere, which hovers at about 5800 kelvin. The sun emits, radio waves, infrared, visible light, ultraviolet and x-ray waves. Even though the sun produces gamma rays, it doesn’t actually emit these rays. The gamma rays are a result of the process of nuclear fusion in the sun and these extremely high energy photons are transformed into low energy photons before they have a chance to reach the sun’s surface, and are then emitted out into space. The light which the sun emits is regarded as a wave, and is made of several colours, each of which represents a wavelength. The wavelength and colour of the light which something emits will be determined by the kind of element which produces it; in the case of the sun, it is made up of many of the noble gas elements, and so to determine the wavelength of the sun, these noble gases’ wavelengths, as well as electromagnetic radiation and UV radiation in the sun, would have to be measured. The solar spectrum also demonstrates wave-particle duality; this is the idea that all particles will exhibit the properties of both particles and waves. When light is travelling, it spreads out and behaves in the manner a wave would, but when it is stopped by something, it returns to behaving like a particle. The sun’s radiation is made up of patterns, known as spectral lines; these can caused by the change in energu in the atoms, when they emit or absorb electrons. The spectral lines from the layers which make up the Sun’s atmosphere can now be measured, using X-ray and ultraviolet ray observations, from a spacecraft. The scientific community in the UK is making strong progress in this area, having created a top class research programme which is conducting experiments on the NASA Solar and Heliospheric Observatory, as well as NASA’s Solar Maximum Mission.